One of the challenges the amateur historian faces is that oral history is just that; oral. It consists of many threads, many truths and a huge amount of speculation, tempered by half-memory and rumour. Anecdote is neither fact, not proof, and without names, written histories or external corroboration, it can be very difficult, if not impossible, to discern the actuality. Maps are not infallible, but can be a good indicator to changing history. I include some here for perusal of readers who’re interested in the speculation myself and reader [Howmuch?] have been engaged in over what caused the scar in Jockey Meadows. We don’t know, we have no idea. It’s interesting, like a discussion in a pub. This is not an adversarial process, but a continuing, delicious engagement with landscape history. We don’t pretend to know the truth. but the black art of attempting to find it is worth the experience alone. 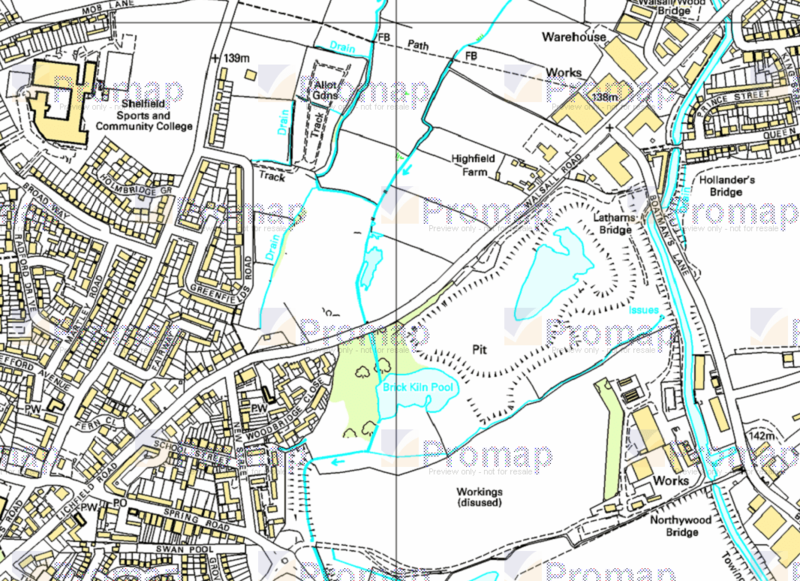 Current OS mapping for Jockey Meadows - note the wet area southeast of the field boundary north of the A461. Click for a larger version. 1884 1:2,500 map. No sign of any pit or extraction in Jockey meadows. Click for a larger version. 1919 OS 1:25,00 draft. Not a lot has changed, but Jockey Meadows are still just that. Click for a larger version. 1938 1:10,000 Epoch 5 plan (best available for the period) - again, much has changed, yet the fields are undisturbed. Click for a larger version. 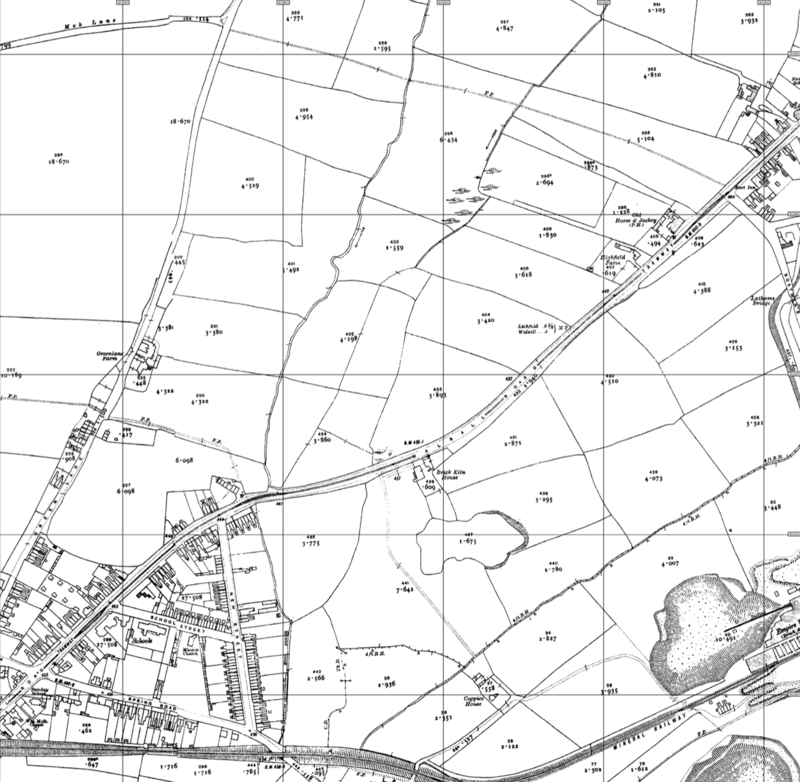 By the 1956 1:10,000 drafting, a large marsh appears in Jockey Meadows. This is remarkable when one considers that by now, the extent of quarrying to the south and east must be lowering the water table significantly. Click for a larger version. 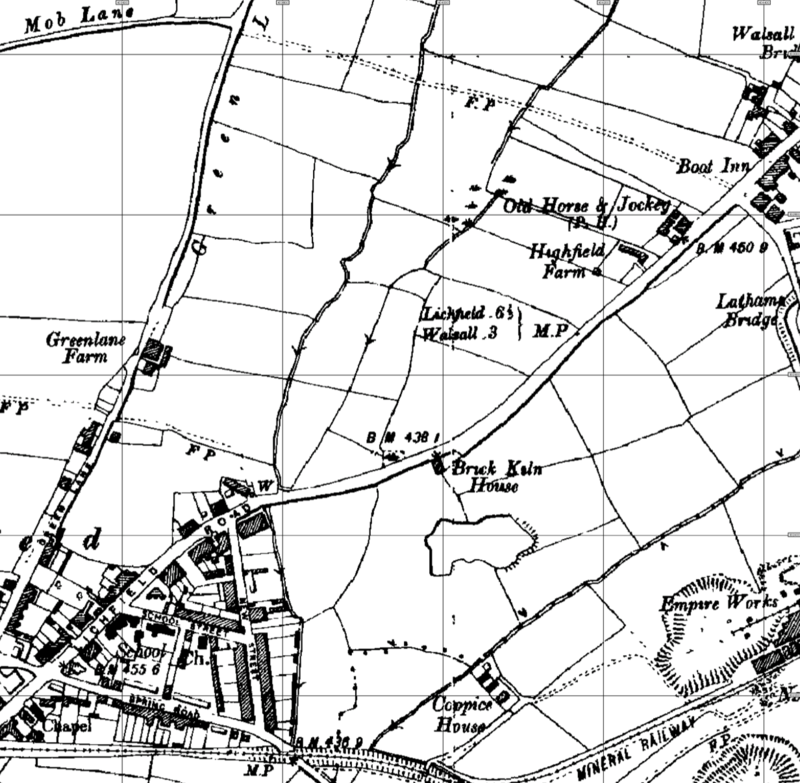 interesting to see the maps of the “famous fields”! 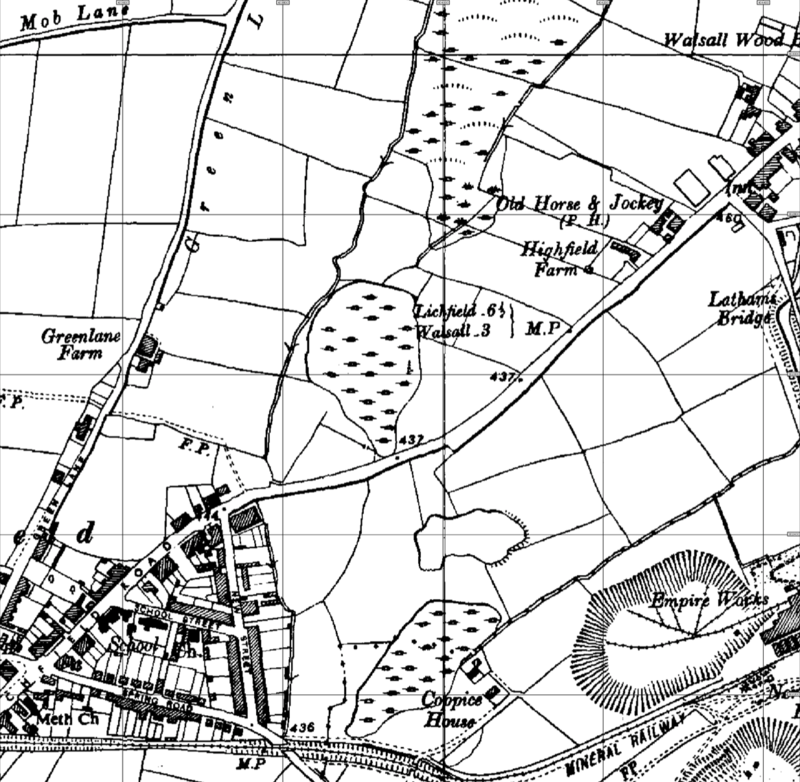 The 1902 map you showed in one of your earlier blogs has a marsh area..but no official clay pit. I would not doubt the word of the local retired and well-respected localbusinessman or his wife who gave information concerning this field …for one minute. I think that if a huge one tonne bomb had landed in this field in the last war it would have made one big bang and one big crater and the blast would have been enormous! So what is or was the area? A good question in every sense. The maps do not show the effect of subsidence caused by the coal mining locally and this is a pity. Local tradition is that the canal and the canalside houses were level at one time; this can be checked..I think you have kindly published some photos and details in your excellent blog , quoting locally published materials.This might show how much the area has sunk over the years. The easiest thing to do is to simply ask the local farmer at Highfield Farm about landfill on the field ! The latest OS map you show indicates the presence of a pool..April 2007 Google photo shows it filled in! 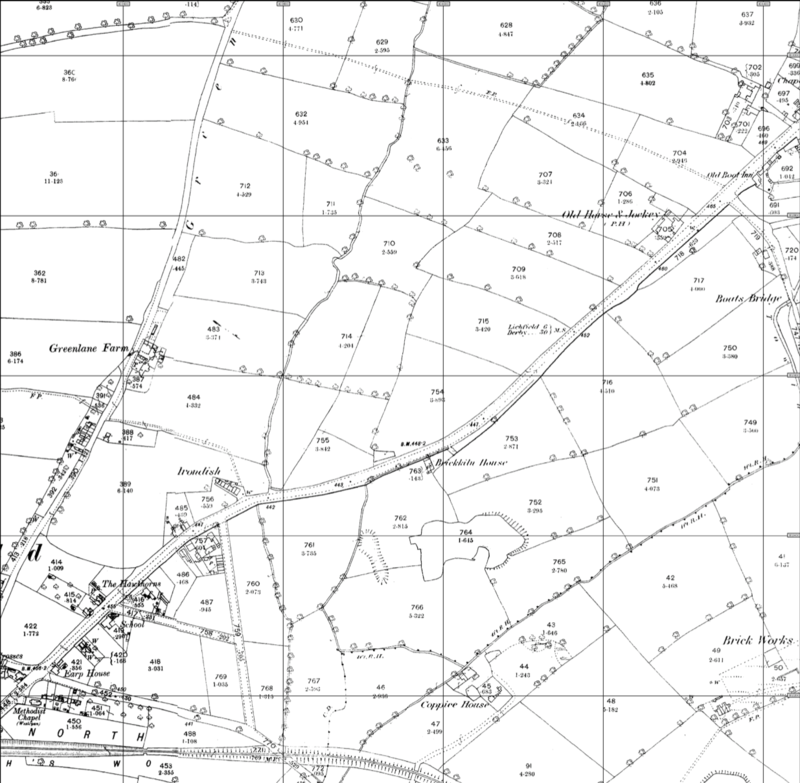 There were many unofficial pits dug during the General Strike in 1926…were these mapped or recorded by OS do you know? I believe that OS make deliberate mistakes to see who copies them for use in their own maps! By the way, I do have the names of all of my sources . Submitted on 2011/04/24 at 6:13 pm | In reply to D.Evans. I don’t doubt anybody’s word, but until these people come forward with their story, it remains anecdotal and unproven. You have mentioned a one ton bomb, we did not. All manner of stuff could have happened there, we simply don’t know and evidence is scant. Subsidence doesn’t cause soil disturbance in the manner suggested, and sinks and voids created by this, or mining of any kind are recorded by the Ordnance Survey, as are any other. As you can see, the course of the two creeks doesn’t alter, either, and there’s no sign of spoil nearby. You can’t abstract without spoil of some sort. It will be difficult to ask the farmer as the farm is now demolished after his sad passing a few years ago. The pool shown on the current map is caused by swelling of the creek and is on the south of the field boundary, and is not contained within the scar. I pointed this out in the original conjecture. I’m in a position to understand the genesis of the mapping concerned, and you have to go a few mile east to hit a copyright trap. Simply put, if there was a sufficiently sized void, they would record it, or at least break the contour. Until there are names and stories from more than one source, this remains undecided. I would welcome any contribution you could encourage these people to make, and I’m happy to publish any work by any party – including yourself, you write well, after all – that can help record and develop the written history of our area. That’s why I do this, it’s a community effort. brainstorming..I wonder if Brownhills UDC records have any mention of this site, pre-war, or postwar. Given the flooding along this road in the late 1940s and 1950s to my own knowledge, and mentioned by one person as having been a problem before the war, it may be that records exist..engineers and surveyors, possibly. Brian Rollins book does not appear to show where the galleries were for the Coppy Pit or the Aldridge Colliery, but he gives a few pages to the problem of subsidence and show a photo of a house in Hall Lane. Aldridge Brick and Coal Co records may show information. Have you been able to visit the site at all? So, an RAF photo shows pools which later become marshland. Is it possible to determine the depth of the pools from the 45 photo. What a pity the Vigo pool is not in the photo. It might be possible to compare the apparent depths of the . I wonder if Aerofilms have anything? The washing-up will have to wait a little while more, I think! Wow. I didn’t know OS used deliberate faults to track copyright. Any examples? Walsall Wood and its many water holes has been a source of fascination..and danger..for local young lads over many years. After winning the battle to save the human race…tended to finish quickly when you got hungry and knew that real fish and chips from the chippy in Brookland Road awaited..there were two ways home. One was across the boggy fields.But you risked getting your pumps wet . We were convinced that the fiendish creator of this footwear also invented and has installedsandpaper inserts . These fields were where you saw enemy miniature fighter bombers in low formation over the sodden ground ( I think that’s what we called it). These were dragonflies ! But the pool was too difficult to get to and keep your feet dry..even though there could be The Great Pike in there.We chose to retreat from the possible clutches of this beast. Well..he was supposed to be bigger than us and nobody wanted to lead THAT battle..not when there’s chips! The Great Elusive Pike was rumoured to have a cibling…in the the Vigo Pool. Now, this was another world of danger, but real danger. The pool was very deep, the raft was two long scaffolding planks nailed together. But, the temptation to venture out was irresistable. My solo venture taught me my lesson. First learn to swim, second, find shallow water. I hadn’t passed either and was lucky to get out of there. My parents never found out ! It was only a few months ago that I learnt that there really had been a pike..not in the Vigo Pool, but in the Atlas. It was observed quite often but a neighbour of mine who spent happy hours there. The pool was unlike the other marlholes. The water was clear..the pool was fed by a stream..probably the one which flows by the Jockey Pool in fact. One day and despite the advice from my angling neighbour who was quietly watching his float, a visiting “SubAqua”policeman donned his frogman gear and went down.. and saw that the tales were, indeed , true and accurate. He came out quicker than he went in! Emerging from the pool the bobby was as white as a sheet , shaking and “needing a fag.” But he never dived that pool again, I am told. But then, our Task Force could have told him! I’ve been looking again at the maps and the full 45 RAF photo which you featured in one of your earlier blogs. I hope this will be helpful to make an objective evaluation based on known documentary and other tangeable or readily-available evidence. How deep was the Jockey Pool? Perhaps not so deep! The Vigo Pool..a worked- out marlhole was very deep..but had no bullrushes or reeds in it. The Jockey Pool is known to have had reeds in it. An indication of a shallow pool..and, like the Vigo Pool, of it being a worked out, or abandoned site? The 38 map would have taken some time to produce before its publication;surveying,draughting, redacting possible, re-checking hopefully, then being printed. The OS used to be based in Chessington Surrey. They might be able to give some indication, even though this 38 map is not OS. The disappearance of Brick Kiln House may hold a key. I don’t have the original maps, and I can only enlarge on my laptop screen..but it seems that this was a working brick kiln..and had the kiln(s) by the house in the maps. It does not appear in the 45 RAF photo. Why did it close? Why was it pulled down? When this happen? page 41 photo..Vigo Brickworks..the clay dug here was said to be of inferior quality to that of other brickworks. How deep was the overburden at the Jockey Pool site, I wonder, What was the quality of the clay dug there..if it was a clay pit. Now we have a deep landfill hole or claypit, I am not sure what it is, just opposite an the south side of the A461…How deep is the overburden? How good is the clayetc etc. etc..? Have modern firing technique enabled previously unsuitable clays to be used in brick manufacture? Brian Rollins book shows a photo of boys cycling in the Clayhanger floods..was this photo taken around the time of the 45 RAF photo, which also shows extensive flooding there? I wish you succes in your continuing investigations and research. This may prove to be quite a challenge for you and your colleague. The Infamous Atlas Pike was called Hercules, and was eventually caught, by the way. My own Hercules was black . It needed the frequent individual care and primeval attention that only a lad could give. It had a little satchel and a finger-severing rack. It could wear your pumps out in no time, and give you blisters. Its mating call was a double ringing noise. It was a lad’s personal passport to The Great Plains and Steppes which surround the Wood. It was a real bike.I would soon grow into it. I certainly felt this was the case sometimes and the scars, though long-faded, are still there. No, don’t ask ! The satchel was very useful, for hiding “live” things from the Fox covey. Better than your shorts pocket..” just in case we meet Mae West” my mates said. I had no idea! Hercules made the Tank Traps much more fun..either wizzing down and catching flies in your mouth as you did so, or, if you hit a brick, as an effective “steam catapult”! you just had to stop at the Fairy Pool “to see …just to see, mind “…now only the stump remains. There were Rescue Stations where life-giving Tizer was bought, downed ..almost in one..and Jones Crisps and their packets of salt saved the day..three such come to mind, Hastilows, Headleys, and the bike shop/shed by the railway bridge in Shenstone. The fields near old Jack Stackhouse’s cottage in Hilton throbbed with insects and birds in the hedgrows, the Flats by the chicken farm had skylarks, pheasants..cuckoos..swallows, swifts “everywhere”. Most of the hedges have since been grubbed out..and the Oklahoma style fields are now almost silent. But I hope the Crane brook has still got frogspawn, newts, and the occasional stickleback. The two local cricket pitches gave their frequent shows of sport, sadly Stonnall’s was ploughed under many years ago, and its trees felled. Only Wall’s pitch remains. Owzat? The finale to these sorties, and the coup de grace, was the return “over the top” to the Wood…single speed bike, remember. Nowadays I can delight to see Bob’s video clips of modern-day cycling ventures ! looking at your lovely photo of red deer in Green Lane I was surprised and pleased that this area is now a Site of ..Scientific Interest (?) and that it attracts deer there. Whilst you were walking or cycling over this land did you gain any useful information about the apparent scarring there?